When we moved into our house with our cranky tabby Annie, it wasn’t long before I wanted to add a second cat to the family. By then Annie was three, and her personality was set. We thought bringing home a kitten would bring out her softer side, assuming she had one. We couldn’t have been more wrong. It turned out that Annie had the maternal instincts of Joan Crawford. We acquired Ozzy in much the same way we did Annie. It was another unplanned litter, this time the mother cat belonging to someone working temporarily in my office. This person lived on the street behind our house, and one day brought over two kittens for me to choose from. Their mother was a Russian Blue, and their father a tabby. 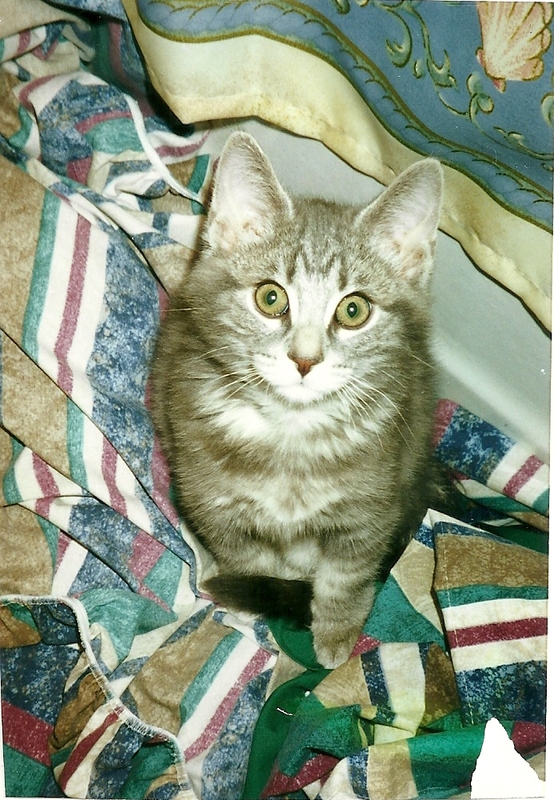 Both kittens were male, with handsome dark gray coats, one solid and the other with marble stripes. I sat on the floor, the solid boy aloof while the other was more curious, climbing on my lap. He was adorable and I was smitten. I chose the tabby-striped kitten, and because the owner had more kittens at home that looked like him, we put a drop of nail polish on his body to be sure I would get the right little guy when they were old enough to go to new homes. When that day finally arrived, Annie was less than thrilled. She showed him no kindness, the only thing she wanted to show him was the door. She puffed up to twice her size and must have resembled a tiger to tiny Ozzy, who tried his best to puff up and look formidable. Their meeting can be compared to the scene in Jaws when Quint crushes the beer can and Hooper responds by crushing the paper cup. They hissed and cursed each other and with one quick swipe from the aggressive female, Ozzy was down the stairs. Ozzy was a happy, robust cat until he was about three years old. He was having difficulty using the litterbox and appeared to be in distress. The vet took x-rays and saw that he was backed up. The vet performed a procedure to unclog him, but the issue became a chronic condition. He was going to the vet weekly, still unable to use the litterbox with any regularity. Ozzy was finally diagnosed with chronic constipation due to a low-functioning colon. This vet put him on two medications, a stool softener and a motility drug for his colon. We had hope that this would put an end to the problem, but unfortunately, it didn’t. We tried other ideas suggested by our vet, but nothing worked. When holistic methods failed, our vet told us there was nothing that could be done for him. Without saying it, the vet indicated that euthanasia was looking like our only option. We sought a second opinion with another practice who is now our current vet. They kept our kitty on the same two medications, but added a low residue prescription food. He now had a food that produced less waste, a med to soften what waste he did produce, and other med to help him pass the waste. This combination saved his life, and we follow this regimen 10 years later. All was well with Ozzy for quite a long time until one day I received a phone call from my mom, who was babysitting our animals. She was very upset, our laidback, loveable boy was howling at her whenever she went near him. Something was very wrong. Back to the vet we went for more tests. It wasn’t until he had an MRI did we uncover the newest issue—inflammatory bowel disease. We were devastated, this guy has gone through so much, and now another medical problem. We were prescribed prednisone for this condition, which he continues to take. Ozzy is a lovable lap cat. He is laid back, and never put up a fuss through any of the procedures he endured. From blood draws, enemas, x-rays, and MRIs, he took it all in stride, his sweet personality never changing. It’s a shame such a sweet cat had to suffer so much. Ozzy has lived with chronic constipation and inflammatory bowel disease for years. He also suffers from arthritis for which we give a supplement, and occasional bouts of vertigo. We had no idea cats could have vertigo, and we were certain that trip to the vet would uncover something horrible like a brain tumor. 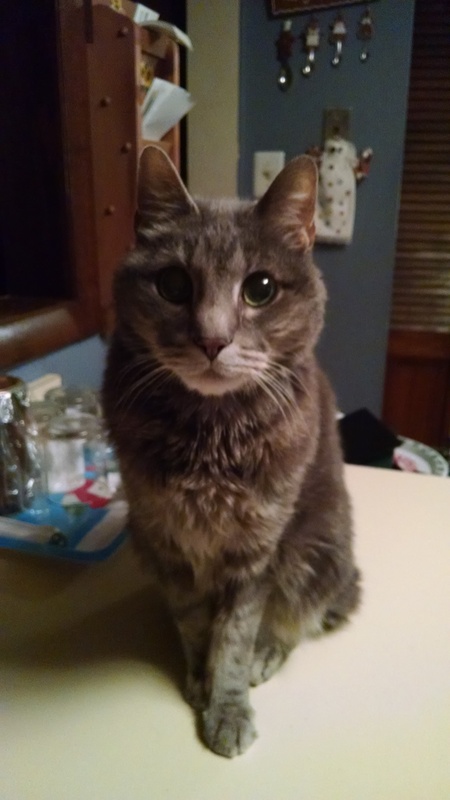 Ozzy will turn 14 on December 18, 2015. We have had 11 more years with him than we had expected. His food and medications to keep him with us may cost the equivalent of a car payment, but our little man is more than worth it. I know one day his conditions are likely to take their toll on him, and he may get other problems due to all the long-term medications. We will lose him one day, we’ve come close several times, and we will be devastated. Every day he is still with us as a blessing. I love you, Ozzy.